When you leave a comment on THIS post by 6 p.m. CT Sunday, July 28, 2013 you'll be entered in the DRAWING for a signed copy of the book I review below. If you mention in your comment that you’re a follower (see in the left column “Join This Site” and “Follow by Email”), I’ll add your name a second time in the drawing. You must be eighteen, have a U.S. mailing address, void where prohibited. You can read details about my book giveaways at Disclaimers. Jason Brannon stumbled through his own maze for much of his adult life and only recently found his way out. During his stint inside The Maze, he was the author of The Cage, Lake October, and numerous other dark fantasy titles. His fiction has been translated into German, nominated for awards, and even won a few. Since locating the exit to the labyrinth and escaping, he has made a home for himself in Amory, Mississippi where he enjoys spending time with his son and writing fiction that weaves faith and fantasy together. A near death experience transports Jamie Burroughs into The Maze, a realm every bit as peculiar as Lewis Caroll’s Wonderland, yet engineered with the moral intent of C.S. Lewis’ Narnia. Built by angels and demons and filled with traps and riddles, The Maze gives whoever enters a face-to-face encounter with their sins. For Jamie, The Maze becomes a terrifying journey through a world of darkness where his soul and the lives of those he loves hang in the balance. With his family in danger and his soul in peril, Jamie is forced to reevaluate the kind of man he truly is as he struggles to escape The Maze before it’s too late. 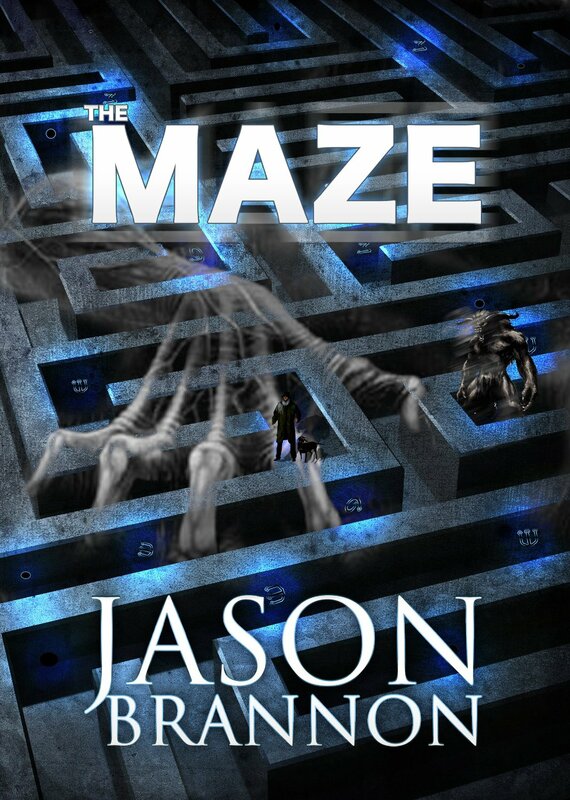 Jason Brannon gives The Maze vivid descriptions as Jamie finds himself inside a frightful maze with no exit in sight. I’m claustrophobic and I shared Jamie’s heightened anxiety as he searches for a way out of the maze. Inside the maze Jamie finds help from angels and fear from demons. He is reminded of and must face his past sins. What must he do to escape the maze? Answer that and he will have solved the riddle of the maze. As mentioned in Jason Brannon’s biography above, Jason weaves faith and fantasy together in this book. There is no doubt of God’s love for the one who sins. If you read books like The Maze, you’ll love this book. If you don’t read books like The Maze, Jason Brannon’s attention to details within the maze and his ultimate moral theme will please you. I read it and didn’t have nightmares so maybe you won’t either. 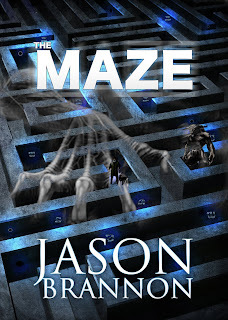 Remember: leave a comment on THIS post by 6 p.m. CT Sunday, July 28, 2013 and you'll be entered in the drawing for a copy of The Maze by Jason Brannon. You must be eighteen, have a U.S. mailing address, void where prohibited. Please, please remember to leave your email address or I cannot enter you in the drawing. I’ll need your email address so that should you be the winner I can get in touch with you for your mailing address. I’ll announce the winner in Monday’s blog. Till next time ... keep on smiling. Thanks Jo for letting me know Jason is in my backyard! Just 60 miles away. The Maze sounds like a fascinating book. Pat, You're welcome...just 60 miles away! I appreciate you following my blog and leaving your comment today. The Maze sounds like a good read with lots of twists and turns. Katie, twists and turns for sure! Thanks for coming by and leaving your comment. So glad you follow my blog. Shelia, what a treat to find that you know Jason and his mom and they live in your hometown! Thanks for coming by and leaving your comment. I so appreciate that you follow my blog--thank you. Hi Jo, and nice to "meet" you, Jason. Jason, I write suspense. In my nine-book contract, my first book released in March. Thanks for this blog post. I wish you all the best and continued success in your writing career. Diana, you're welcome. Glad you write suspense and find a connection with Jason and his writing. Thanks for stopping by and leaving your comment. Thanks again for your post and for running this contest. I definitely appreciate it. Patricia: Only 60 miles! We're practically neighbors. Sheila: Nice to see someone from Amory represented here! Dianna: I will make a point to check out your website. Always glad to meet a fellow writer! Looking forward to reading your next book, Jo! Jason, so happy to have you The Maze with us. Thank you for the kind words about my Caney Creek Series and in particular boook 1, That Summer. One commenter will be the lucky one who wins your book. can you post a link to where we can buy the book? If Jason has another purchase link he'd rather use I hope he'll post it here. I don't usually read fantasy but Jason's book sounds great. Congratulations! Would love a chance to read it. It intrigues me. Cheri, glad you found Jason's book intriguing. I did too just by looking at the cover. Thanks for coming by and leaving your comment. Thanks, Jo for sharing about Jason's book. I do follow you and this looks like an amazing story. How often do we push those thought in our escape place of our minds...only to be reminded God tells us of the freedome we'll have by leaving that sin at his feet. Diane, you're welcome. I appreciate you following my blog. Thanks for stopping by and leaving your comment. Wow, what an amazing story. I'd love to win a copy. Thanks for introducing me to Jason and his book. Jackie, you're welcome. Glad you found an author you didn't know. The story in the book is amazing.